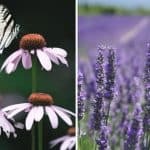 If you love to see butterflies during summer and want a garden that is as friendly to wildlife as possible, a great way start is by growing a variety of nectar plants that will encourage butterflies and moths into your garden. 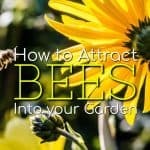 We’ve put together 12 fantastic nectar plants you can grow at home to do this and you can also take a look how to attract bees into your garden for some more garden tips on how to encourage bees. Otherwise called the butterfly bush, this plant is adorned with butterflies in summer and is easy to grow in almost any soil. Depending on the variety, Buddleia will flower in pink, red, white or purple. As the shrubs can grow from 5’ to 8’, the plant needs pruning well in Spring. These fragrant lilac-blue flowers can be used for edging beds or grow to form an attractive, low-growing hedge. Lavender will grow well in a sunny, sheltered position and needs well-drained soil to thrive. Plant in your garden during April or May. This plant stems up to a meter tall with heads of pale purple heads that flower from August to October. This plant is easy to grow from seed, plant between March and April in well-drained soil. Verbena Bonariensis can provide useful height at the back of a border. Marjoram, known by many as oregano is a perennial herb that can grow from 20 to 80 cm tall. White, pink or purple flowers will grow from June to September. Marjoram makes a good edging plant and useful ground cover, requiring little maintenance. The Perennial Wallflower is a sweet smelling purple flower which flowers from April all the way through the summer. Otherwise called the Bowles Mauve, it makes a great bedding plant that will grow well in full sun or light shade. For the best growing results, you should plant in well-drained soil. New England Asters peak in butterfly season. They are easy to grow and mildew resistant. Good varieties include Helen Picton, Harrington’s Pink, Barr’s Pink and Rosa Sieger. This pretty flower is scented of meadows and sweet cake which makes it irresistible to butterflies and moths. Some varieties which are good for growing at home include two pinks, Eva Cullum and Monica Lynden-Bell. Franz Schubert is a good lilac variety. This woody-based perennial, sometimes grown as a biennial, with grey-green leaves and dense clusters of crimson, pink or white, slightly fragrant flowers from late spring to autumn. A dusky-leaved sedum with neatly serrated foliage, this plant is bee-friendly as well as attractive to butterflies and moths. The plant flowers heads of red stars in August. The grey-leaved sea stock needs a warm, dry site. 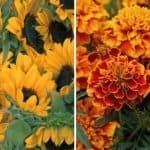 It also requires deadheading, if left to seed it will die. It’s scented white flowers attract moths, bees and early butterflies and it blooms from late spring onwards.